The purpose of Chapter 8 and 9 is to present two practical applications of goal programming that illustrate the methodology detailed in Chapter 1–7. The first, application, detailed in this chapter, relates to the field of healthcare planning, more specifically to the planning of a medical assessment unit in a primary care hospital. It is a specific example of the use of integer goal programming and an illustration of the trend of integration and combination detailed in Chapter 7, with goal programming being combined with simulation. The technical details of the research are detailed in Oddoye et al. (2007, 2009). 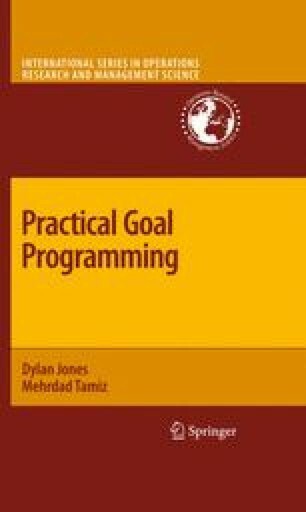 However, the purpose of this chapter is to look at the application in the context of the wider field of goal programming and identify the modelling techniques and paradigms used.